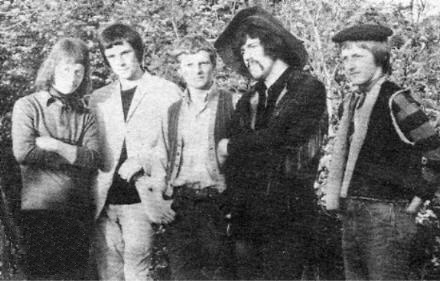 In 1968 the band Taxi was formed in Ballymena, County Antrim, by two ex members of another northern band called the Van Dykes: Sammy Nevin and Sammy Moore. Taxi's inaugural gig took place in Ballymena town hall, a venue usually reserved for Irish dancing competitions, but Ballymena was moving with the times. The Flamingo ballroom in the town was already a famous venue for UK bands such as the Stones, the Troggs, the Searchers, Amen Corner and numerous others. Taxi were a huge success thanks to a lot of support from the local girls grammar school, and went on to perform in Belfast clubs such as Sammy Houston's Jazz club, Betty Staff's and Clarke's Ballroom among others. Around that time Alan McAlhagga, a member of Cahir O'Doherty's band The Gentry, introduced them to Larry Mooney from Dublin, who became their manager and widened the band's scope to include gigs in Dublin and all the major southern towns. The initial line up was Sammy Nevin on guitar and vocals, Trevor Erwin on guitar, Paddy McCauley on drums, Kipper Moore on flute and saxophone, and Sammy Moore on bass guitar. Sammy Moore left the group and was replaced by Henry McQuillan as bass guitarist. The group travelled around the country in a transit van with a broken heater, sometimes travelling over a hundred miles to a gig and then back to Ballymena in the wee small hours. Crossing the border was a scary experience in those days and to ease the tension as they travelled between towns they often mooned out of the back of the van at passing show bands, and the show bands in turn threw flour and eggs at their van (a common practice mentioned in almost every showband memoire!-ed). Larry Mooney put the band up for a short period in a house in Dublin [Clontarf] that they shared with Thin Lizzy. Trevor Erwin remembers Phil Lynott as a lovely guy, although memories of that time are a bit hazy, if you get my drift. The band was once approached by a young guy who went to a Jethro Tull gig in Dublin and stole Ian Anderson's flute from the front of the stage. He flogged it to the band in exchange for some goods, but recognising an opportunity for some good publicity the band returned it to its rightful owner. 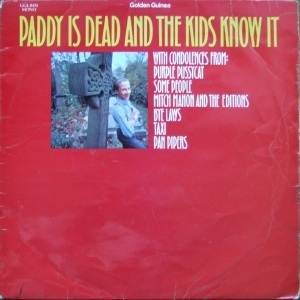 Whilst in Dublin they contributed two tracks to the compilation album, Paddy Is Dead And The Kids Know It [released in 1969]: a cover of the classic 'Summertime' featuring Sammy Moore on flute and a track they wrote themselves called 'Counting Time My Way'. They also appeared on the RTE programme 'Like Now' [on October 4, 1969] where their performance received critical acclaim. Touring took its toll on the guys though they loved performing and the adulation of their fans. Occasionally they were met with bemused silence in some of the more rural venues where people were expecting a showband and instead got hard rock and lots of leather and snakeskin, but the more usual response was seething, sweaty bodies rocking the room. A promoter from Ballymena secured the band a tour in Africa at the start of the seventies, but this proved to be a step too far as tensions were starting to rise between some of the members. They decided to split up instead. Although some went on to play in other bands subsequently, none achieved the same level of success as Taxi. The only band member to stay in the music business was Sammy Nevin. The rest of the guys gave up life on the road for jobs and lives in the real world. Trevor is now a Clerk of Works for a Housing Association and has lost touch with the others, but he still plays and collects guitars for his own amusement. Taxi split in 1970 or 1971. Sammy Nevin joined Ironhorse. Is this the Sammy Nevin who later played in Rondo Rondo? Sammy is still active, one of his recent bands being Bowana. Another musician's name has been mentioned in connection with his group and that's Sammy Whiteside (lead guitar), who later worked with Alan Dee. This may be a pseudonym.